Iguanas in the Snow and Other Winter Poems/Iguanas en la nieve y otros poemas de invierno is an absolute delight. Parents, do not be intimidated by the word poem in the title! What Francisco X. Alarcón gives us with this picture book is an introduction to image. The poems, short and simple, will teach your children to grow with an acute appetite for sensory details. This collection, like the others in its series, is very visual and while it explores much associated with winter it also touches on many important themes our children face each day such as identity, community and cultural awareness. The illustrations, by Maya Christina Gonzalez, are vivid and play a large role in the overall joy that is found in this book. 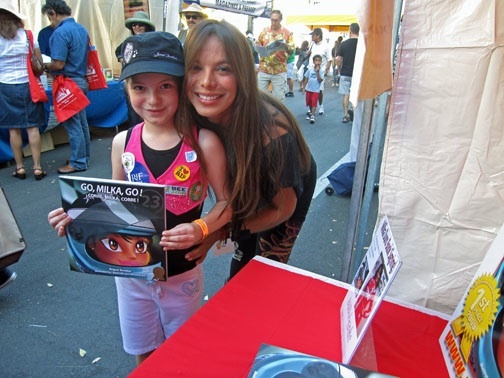 Gonzalez does an excellent job complimenting each poem and her artwork is colorful and alive. Suited perfectly for children in grades 3-5, this book will help children begin to build their creative process using small detail. Because the poems are observations, young readers will be able to identify similar visual details during their own day-to-day experiences. While in nature, walking to school, or even while spending time with family at home, they may begin to notice detail in a new way, an important skill for all children. This book, and the others in this seasonal series provide an excellent tool for building sensory skills. Furthermore, if your child is a young student of Spanish, this book is effective in isolating a few words at a time, so the Spanish does not become overwhelming. Because the poems are short, they can be broken up into daily lessons. It is a perfect and joyful book for any age to read. For this book and the others in its series (Spring, Summer and Fall), click here. Get it in time for Christmas! We wanted to share with you one of Jacey’s favorite poems from the book, perfect for the season! Happy Holidays! 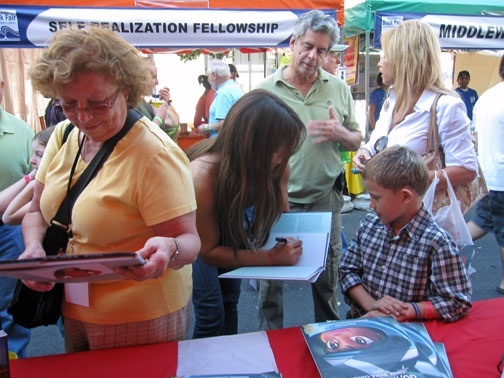 For the weekend of November 13-15, Jacey and I headed down to Miami for the annual Miami Book Fair International. 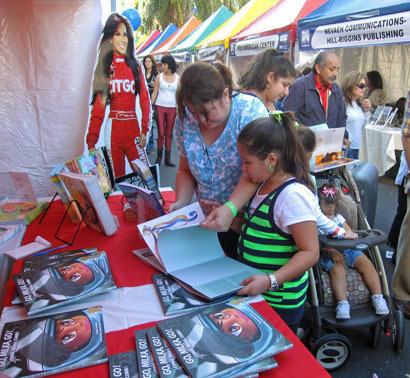 We were excited to participate in such a popular annual event and to spread our mission of bilingualism to the wonderful South Floridians! 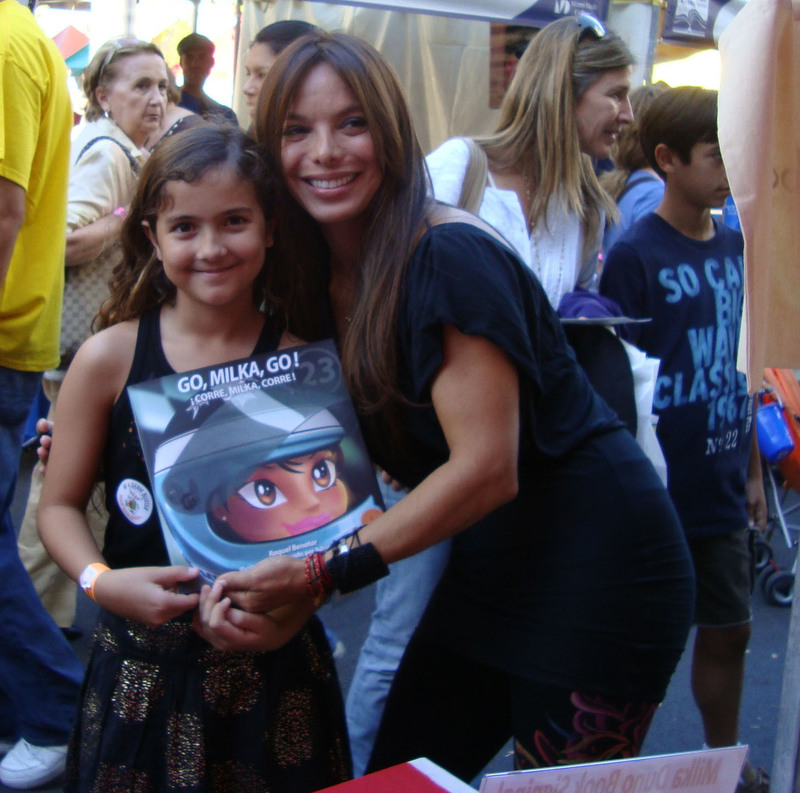 Milka’s book, Go, Milka, Go!/¡Corre, Milka, Corre!, highlights her life and the importance of studying hard to succeed. 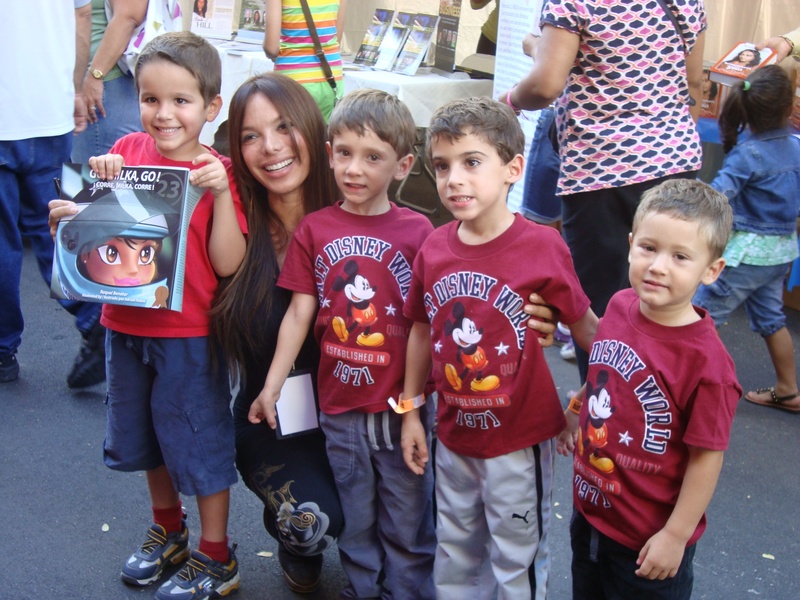 She spoke with children about the importance of education and her foundation, Milka Way. The program’s mission is to inspire children and young adults to “Aim for the Stars” and achieve academic excellence. I personally felt inspired by how she brightened up the day and spoke words of encouragement for so many children, families and fans who got to meet and speak with her. 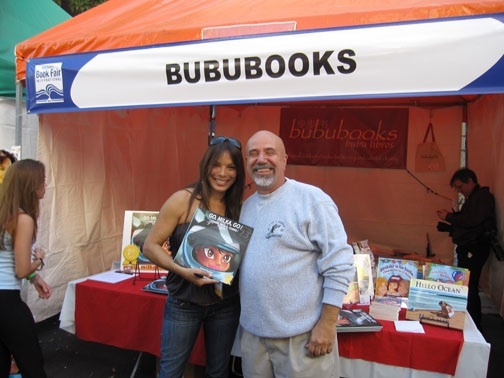 Indeed, one fan even drove two hours just to meet her and get his copy of her book autographed! 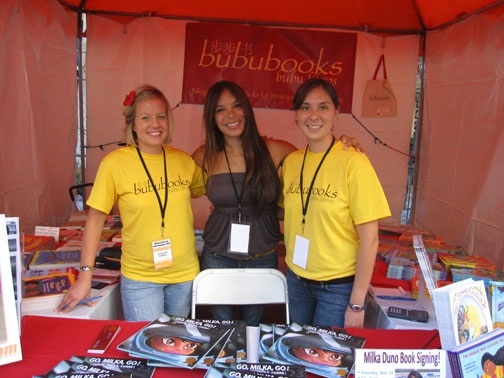 We were honored to have Milka join us because her passions are so closely aligned with ours and because she is such a great person. We share our focus on education and literacy not bound by language. We’ll be sure to let you know the next time Milka will visit our booth! 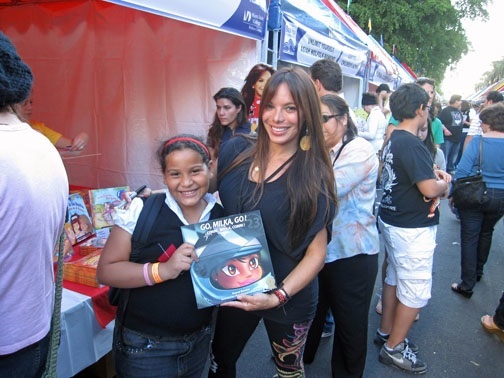 Milka’s first book is bilingual in Spanish and English and at the reading level for ages 8-12. We brought back a limited number of autographed copies. Buy yours now before they’re gone! Check out some of the photos below. Thank you Milka! Many of you have probably heard of the Day of the Dead, celebrated in Mexico, and more and more in the United States, this time of year. It is a holiday for family and friends to gather and remember friends and family who have passed away. Not a somber event, the celebration includes cleaning the house, building an offering, or ofrenda, that includes candles, flowers, their favorite items while alive and other items to help them on their journey and visiting their graves. This holiday also coincides with the Catholic holidays of All Saints’ Day and All Souls’ Day. example, a large feast is cooked. Fruit is placed on the table in odd numbers with the top of one cut off. Chopsticks are placed upright in a bowl of rice. The front door is left opened during the ceremony. These actions allow for the dead to enter and enjoy the food! Many in the United States have embraced the Day of the Dead holiday. One town in Texas, for instance, held a shoebox ofrenda competition. There are free processions tonight in San Francisco and Oakland, etc. Check your local area for events! In the meantime, enjoy the fall and upcoming holidays! 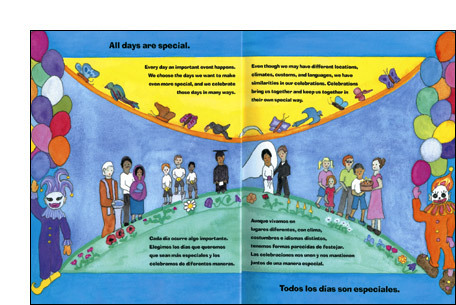 I also would like to use this holiday to highlight a bilingual book we carry at bububooks called: Celebrations / Celebraciones: Holidays of the United States of America and Mexico / Dias feriados de los Estados Unidos y Mexico. In it, author Nancy Tabor explains major holidays in the US and Mexico and how they are celebrated. Be sure to check it out! 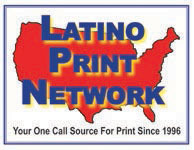 I wanted to share this article I received from the Latino Print Network by Kirk Whisler. A new study from the University of North Carolina Chapel Hill shows that Latino teens who embrace their Latino culture and whose parents embrace U.S. culture live healthier lives, academically, socially and emotionally. I think the benefits of biculturalism would apply to all ethnic groups in the US because embracing both cultures in a family and environment supports a family and community bond. Read on and share your thoughts! Over the years, research has shown that Latino youth face numerous risk factors when integrating into American culture, including increased rates of alcohol and substance use and higher rates of dropping out of school. But a new study from the University of North Carolina at Chapel Hill shows adolescents who actively embrace their native culture – and whose parents become more involved in U.S. culture – stand a greater chance of avoiding these risks and developing healthier behaviors overall. The findings are from a longitudinal study by the UNC-based Latino Acculturation and Health Project, which is supported by the U.S. Centers for Disease Control and Prevention (CDC) and directed by Paul Smokowski, Ph.D., an associate professor at the UNC School of Social Work. Researchers interviewed 281 Latino youths and parents in North Carolina and Arizona, asking questions about a wide range of measures of lifestyle and mental health. Participants answered according to how much they agreed with each question (for example, from “not at all” to “very much”), resulting in scores on a scale for each measure. “We found teens who maintain strong ties to their Latino cultures perform better academically and adjust more easily socially,” Smokowski said. “When we repeated the survey a year later, for every 1-point increase in involvement in their Latino cultures, we saw a 13 percent rise in self-esteem and a 12 to 13 percent decrease in hopelessness, social problems and aggressive behavior. “Such results suggest that Latino youth and their parents benefit from biculturalism,” Smokowski said. The findings are presented as part of a series of articles featured next month in a special issue of The Journal of Primary Prevention, a collaborative initiative between UNC and the CDC. The special issue presents the latest research on how cultural adaptation influences Latino youth behaviors – including involvement in violence, smoking and substance use, as well as overall emotional well-being – and offers suggestions for primary prevention programs that support minority families. Hispanic Heritage Month began this week. It originally began as a week long celebration in 1968 when Congress authorized President Lyndon B. Johnson to proclaim it. During this month, we celebrate the cultures and traditions of Americans who trace their roots to Spain, Mexico and Spanish-speaking countries of Central and South Americas and the Caribbean. Hispanic Heritage Month begins on Sept 15 because five Latin American countries gained independence from Spain on this day: Costa Rica, El Salvador, Guatemala, Honduras and Nicaragua. Also, Mexico celebrates its independence day on Sept. 16th, while Chile celebrates its on the 18th. You can use this month to celebrate Hispanic culture in America and to learn more about it. There is so much to do! For a list of events throughout the nation, be sure to check out http://www.hispanicheritagemonth.net/calendar.html. Of course, with us being a children’s bookstore, we need to focus on activities for the kids! For that, we turn to our all-time favorite, ¡Colorín colorado! On this page, you can find fun activities for your kids, including word searches and crossword puzzles as well as other activity sheets focusing on words and language. Also, ¡Colorín colorado! has set up a link where you can send e-cards to your friends and families! Now, for the adults, this awesome website offers information, history, teaching materials, classroom activities, lesson plans and other resources and links for you to use. Be sure to bookmark that page! 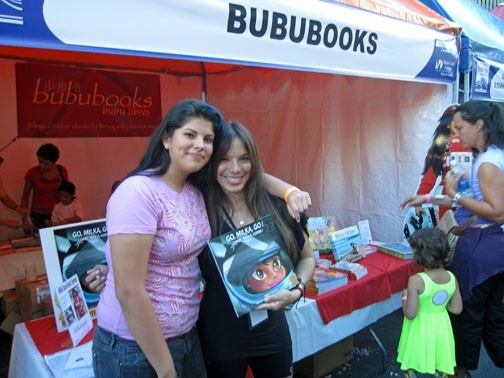 We at bububooks have also created a book list to celebrate Hispanic Heritage Month with your children. Explore the ways Mexicans and Americans observe holidays throughout the year and learn how the common values and beliefs these countries share are reflected in their special days. “Are we as different as we might think? I say sol. You say sun. No matter how we say it, it is the same one.” Nancy Maria Grande Tabor, via a simple text and vivid art, establishes that children of two entirely different cultures are really quite similar. We Are a Rainbow helps young readers begin building the cultural bridges of common human understanding through simple comparisons of culture from breakfast foods to legends. Colorful cut-paper art and gentle language deliver this universal message eloquently. Let’s visit a Mexican market! Along the way you can compare, weigh, count, and learn about culture and customs. From bunches of hanging bananas and braids of garlic to pyramids of melon and baskets of sweet cheese, this Mexican market is full of fun and surprises. Colorful cut-paper art sets the scene for a creative way to build new vocabulary for beginning readers of Spanish or English. From the imagination of poet Francisco X. Alarcón comes this playful and moving collection of twenty poems about spring in English and Spanish. Tomatoes laugh, chiles explode, and tortillas applaud the sun! With joy and tenderness, delight and sadness, Francisco’s poems honor the wonders of life and nature: welcoming the morning sun, remembering his grandmother’s songs, paying tribute to children working in the fields, and sharing his dream of a world filled with gardens. Artist Maya Christina Gonzalez invites us to experience the poems with her lively cast of characters—including a spirited grandmother, four vivacious children, and playful pets who tease and delight. Follow them from page to page as they bring the spring season to colorful life. In this entertaining, bilingual exploration of language, children are introduced to a second language and get a glimpse of another culture. Ve lo que dices/See What You Say explores the ways two different cultures view their own languages through familiar idioms. Sometimes the words we use have a different meaning from what we say. For instance, if a person becomes hasty and does things out of order, in English we say he has put the cart before the horse. In Spanish he is starting to build the house at the roof. Although they mean the same thing, the literal sense of these phrases is quite different. In Ve lo que dices/See What You Say, these contrasting expressions become charming and vivid vignettes. Nancy María Grande Tabor’s signature cut paper illustrations are remarkable in their three-dimensional quality and light-hearted presentation of some very off-the-wall phrases. Children and adults alike will have a great time guessing what idiom each illustration represents. In her first book for children, award-winning author Lucha Corpi remembers her childhood growing up in Jáltipan, Mexico, where the moon hung low and the fireflies flickered in the night air. In vivid and poetic detail, she recalls exploring with her brother the old haunted house of the legendary revolutionary Juan Sebastián, discovering the music that came from the jukebox at the local cantina, and getting caught by their mother for their mischievous adventures. Most of all, she remembers the ballads her father sang and the stories her grandmother told. In her stories, her grandmother passes on an important message about growing up—each person, like the revolutionary Juan Sebastián, has a destiny to follow. Click here to test your knowledge of flags throughout Latin America, provided by WTXL ABC 27 in Tallahassee, Fla. Bet you’ll beat Laura! For some interesting statistics on the Hispanic population in America, click here. Test your knowledge and learn more too! For events occurring throughout Hispanic Heritage Month in Chicago, check out ABC 7 Chicago’s The Ñ Beat with Theresa Gutierrez. Click here for more information. Valdosta State University will host several events throughout month. See the list here–hope to see you there! We hope you’ve enjoyed this posting and are excited as we are to check out some of these events. Feel free to share more! There is plenty of research demonstrating that English language learners (or ELLs for short) learn best by drawing on what they already know. 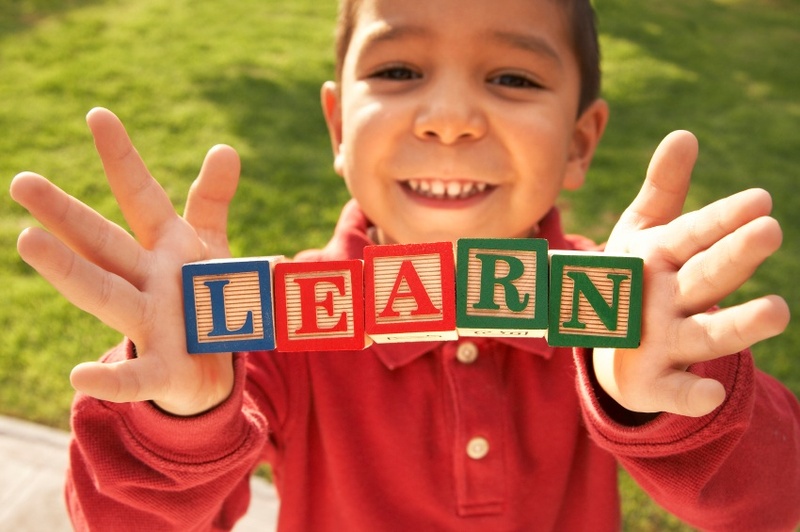 That means, they learn best when they start with the language they already speak, their native language (or L1). Children are not blank states when starting kindergarten. This tends to be an unpopular notion in many places, as it was in the Word Geek’s childhood. The idea back in the Olden Days was to punish a child for speaking anything but the “best” meaning the textbook or Standard version of English. The result was, predictably, that kids who didn’t already speak a pretty standard version quit talking altogether in school and made very little progress, then stopped going to school as soon as they could get away with it. This tended to be around the fourth grade (age 8 or 9). Or, because these children struggle to learn math and science in their L2, they get placed in special education classes in which they become bored and disgruntled. This pattern is NOT recommended! 1. Pair a newcomer (an ELL with little or no English) with a partner who speaks his or her L1 as well as some English. Make sure the partner knows this buddy position is a prestigious job and you are very impressed at how well he or she carries it off. The buddy’s job description should include making sure the newcomer knows the class rules, gets the class assignments, and, hopefully, this buddy does some translating. 2. Invite a parent volunteer into the classroom to read aloud to the class in the L1 of the newcomer(s). If this involves showing lots of pictures, even the English speakers should get something out of it. Plus, they’ll get some idea of what it’s like to be unable to understand every word of what’s going on – empathy, in other words. Not a bad idea! 3. Let the kids speak in their L1. The Word Geek wishes to put this one up in lights, so she will repeat it in capital letters and add an exclamation mark: LET THE KIDS SPEAK IN THEIR L1! Maybe she should throw some firecrackers in to get some people’s attention here, adding extra exclamation marks for more emphasis. LET THE KIDS SPEAK IN THEIR L1!!! 4. Build a class library in the students’ L1s. It’s especially helpful if some of these books are what we once called “ponies,” in the Olden Days. That means, there is the L1 on one page. On the facing page, the same text is in English. This way, a student sees that his or her native language is respected and supported, and the child can go from the known (L1) to the unknown (L2), with a lot less pain and hassle. The Word Geek was once very fond of such ponies and still has a few in her possession. 5. Organize bilingual tutoring, for example by partnering with a teacher of a class a year or two older than your own, in which there are students who speak the same L1 as your students. These older kids who presumably also speak a little more English can help tutor your students, do a little translating. It’s good for their education and self-esteem as well as helping your students along. A person never learns better than when helping someone else learn. 6. Provide students pen pals, whether in their L1 or L2, and whether through e-mail or by means of old-fashioned pen and paper. Go to the first website above to find a couple of online sites to locate e-mail pen pals. This type of writing is a lot more interesting than writing boring sentences in response to even duller reading exercises. 7. Encourage writing in a journal, whether in the L1 or L2. Sometimes, writing about the acquisition of L2 (namely English) in the L1 is one of the best ways to get a student to think about it after school. 8. Create books of students’ own writings. That is to say, with the computer it is relatively easy to type up things that students write, duplicate them, print them out, and even bind them in inexpensive ways. These can be done in the L1 or L2. “Ponies” created in this way can be distributed to the entire class, giving a newcomer a new feeling of being part of a class, not an outsider. Many of the fonts required to print, say, Vietnamese or Arabic or whatever are already available on the internet for free – or relatively cheaply. 9. Use L1 storytellers to support the ELLs language and culture and share with the rest of the class. The teacher can help bring in the rest of the class by teaching a story ahead of time, or having the class read the story or act it out, if they are too young to read it yet. That way, no one need feel left out when the storyteller comes and speaks another language. 10. Put up the signs that are displayed in the classroom in both English and any L1s spoken by students. This shows that the L1 is valued and, therefore, the student who speaks it is also valued. Time for an object lesson: When the Word Geek took an introductory linguistics class in college, years ago, the professor told of taking a rabbit in a cage to a first grade classroom. The children in the classroom seemed inordinately quiet and the regular teacher agreed, saying that the kiddies were all “culturally deprived” (using the parlance of the times). The professor and the teacher silently left the classroom. The kids did not see, but the professor had silently started a tape recorder behind the desk. When the professor got back, as soon as she opened the door of the classroom, the kids were quiet, so she had no idea if her plan had worked. But later, when she played the tape for the teacher, the two adults heard a great cacophony of noise. The whole time the grownups had been out of the room, all the children had been talking to that rabbit, calling him “Mr. Bunny,” telling him not to be scared, letting him know he would be all right. They did not speak perfect Standard English. But they could speak all right and their meaning was clear enough. Why wouldn’t they talk when their teacher was there? As the professor pointed out to us, when someone gets onto you every time you open your mouth, you stop opening your mouth. So, at the risk of beating a dead horse, LET THE KIDS SPEAK IN THEIR L1. They’ll eventually get to L2 that way. But if they stop talking altogether, they’ll never get anywhere. This article was written by Diana Gainer, the Word Geek Examiner, on http://www.examiner.com. Laura Renner added some of her own thoughts as well.